ESCONDIDO–The FBI and Escondido Police Department are seeking the public’s assistance to identify an unknown male who robbed the U.S. Bank branch inside the Albertsons grocery store last week. On June 26, at approximately 3:30 p.m., a white male robbed the U.S. Bank branch located inside the Albertsons at 1509 East Valley Parkway in Escondido. The robber walked up to the counter and placed an open lunch box over the counter. The robber used a demand note and verbally demanded money. No weapon was seen or used. 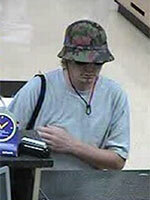 After receiving a sum of money, the robber exited the Albertsons in an unknown direction. Witnesses describe the robber as in his late 40s to early 50s; five feet, five inches to five feet, ten inches tall; clean-shaven with tattoos, and no visible marks or scars. He was last seen wearing a t-shirt, jeans, sunglasses, and floppy hat. Anyone with information concerning this robbery is asked to contact the FBI at telephone number (858) 320-1800, Crime Stoppers at (888) 540-8477, or Escondido Police Department at (760) 743-8477.